This is one of the oldest joints in the city. Sham Shinde owns the hotel The family has been involved in the business for a long time. The popular and mouth-watering misal in Nasik namely Shamsundar which cost usally as 45 Rs per plate and located in the industrial area of Satpur. The musician duo of Ajay-Atul has visited the place among many others. Also a slice of lemon with papad is served with the misal. Many people visit the place especially on weekends. Counting the crowd is not possible but many people visit and the misal curry is prepared for four times a day which is a lot, considering the size of the vessel. Though this misal is located in the industrial of Satpur still the love and liking of the misal here is unbeatable and youngsters, businessmen, elders everybody make it point to taste and pamper the taste buds with Shamsunder Misal. And as we say “loha hi lohe ko katata hai” so the same way, if anybody has SARDI-JUKAM one should try this misal, a perfect fighter for Sardi Jukaam says many of the misal lovers here. It is known for its hot and spicy nature from the begining and the hotel has surely has maintained that quality. The pav are of normal size and sadly not roasted but always fresh and soft. They serve misal filled with rassa A cup of tarri is always severed with misal without order. Tarri is i must say of finest quality spicy, hot, and tasty. Service is very prompt despite of the rush. People here generally don’t prefer curd as it reduces the spiciness and everybody wants to enjoy the spicy zatka. But it’s not like they don’t serve mild misal of course they do that but only if ordered otherwise they will serve you default spicy misal so take this into consideration . Their speciality is that they serve you tarri in different cup and each and every table has it’s own cup so the red colour of the tari on the other tempts you till the misal on your table comes. 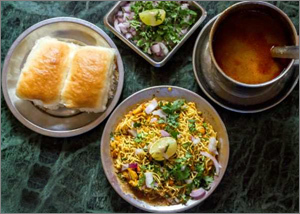 Misal pav is undoubtedly the nashik’s most favourite breakfast. Boiled sprouts topped with extremely fiery curry preparation garnished with sev, raw onion and coriander is consumed by thousands of city people every morning. Extra tarri, onions, fried pea nuts, curd and papad are add-ons and this mixture is usually paired with pav. The “U”s of Marathi food is small in number but absolutely delicious nonetheless! A very Maharastrian dish that can easily convert itself into a full meal and is quite popular as an evening snack and street food. Sprouts are low on calories and high on proteins and vitamins. Usually misal is made with sprouted matki / moth beans or dried peas along with the sprouts. Hanging around all famous Misal pav joints in the city to find out the essence of all these famous misal pav hot spots. And finally after months of digging out dozens of misal pav around every corner finally compiled a bunch of must try misal pav in nashik city. So you can relish you taste buds next morning. The taste of Shamsunder misal lingers in mouth for a long! And the spicy misal unleash a little bit of Happy Harmone.